Looking Closer: Kevin Spacey, the first 50 years. Looking Closer is the first published biography of superstar Kevin Spacey and explores the background and career of this enigmatic man. "I can look any fan in the eye, and say you have no right to anything from me except the best performance I can give..."
Kevin Spacey is considered one of the most talented thespians of his generation. Voted "Greatest Actor of the Nineties" by Empire Magazine, placed third in a 2001 FilmFour poll of the hundred greatest-ever movie stars, he is a double Oscar winner and has been equally successful on the stage, being appointed Artistic Director of London's Old Vic Theatre in 2003. Yet like his most famous screen character, Keyser Söze, he has remained a shadowy and mysterious figure, notoriously protective of his private relationships and giving few intimate interviews. 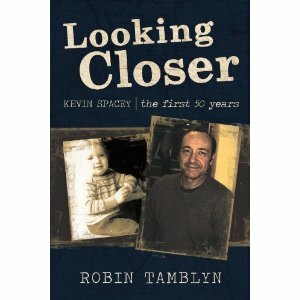 Looking Closer, the first published biography of Spacey, explores the background and career of this enigmatic man. Read Chapter Five of Looking Closer.